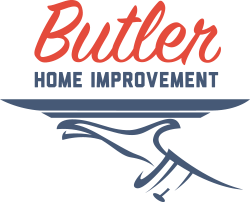 Keep it local with remodeling, renovation, and home improvement services from industry-leading company, Butler Home Improvement! Home Improvement Services in Missouri and Illinois. The contractors and installation specialists of Butler Home Improvement complete all of our interior and exterior remodeling services with craftsmanship while providing Missouri and Illinois homeowners two times the labor warranty of our competitors. When Butler works on remodeling or adding on to your living space, we ensure that the products chosen meet your needs while complementing your home’s visual appearance. Butler weatherproofed an area 16' x 28' under our deck with a Sunspace screen room. They provided a waterproof ceiling and Sunspace walls. All steps from design to constructions was done professionally. The room was built on time and budget. The quality of the workmanship was excellent. We now enjoy a maintenance free room that is perfect for relaxing.